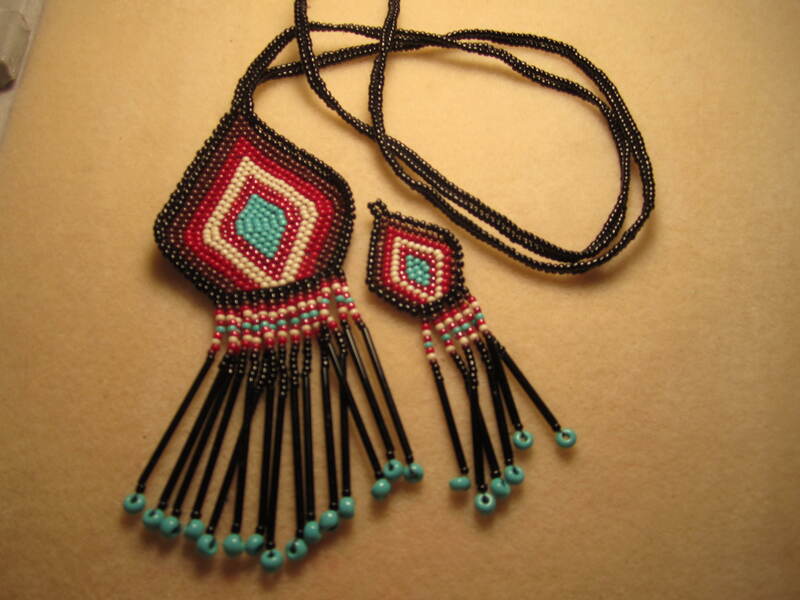 I love making beaded jewelry from seed beads and have done that longer than the traditional jewelry. 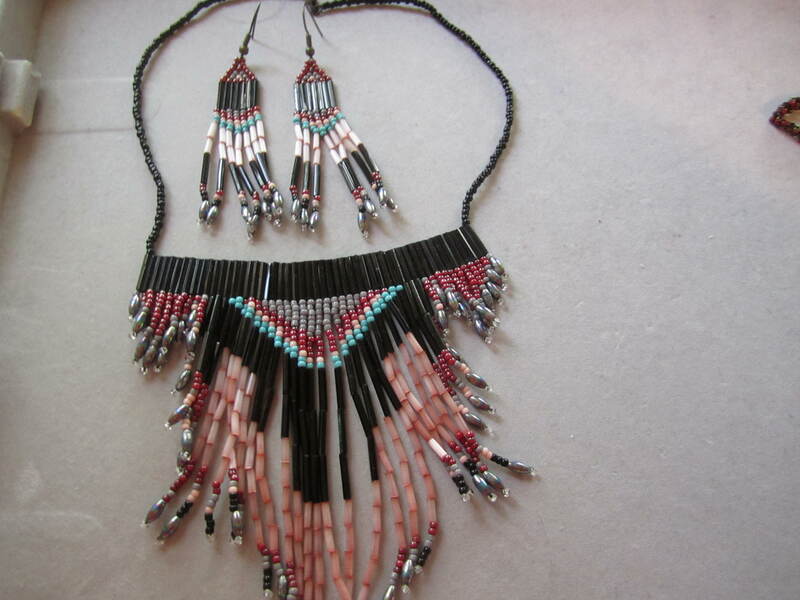 Here are a few of my pieces . 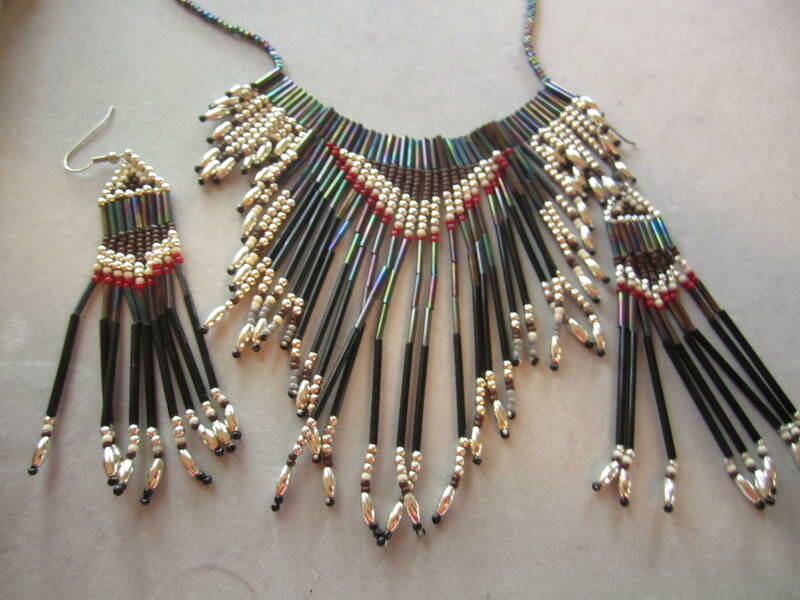 Twenty odd years ago my husband actually made these first two necklaces but I helped out and made the earrings. Sometimes he made the first and then I did the second, but they are so pretty I want to show them off even though I cannot take credit for them !! 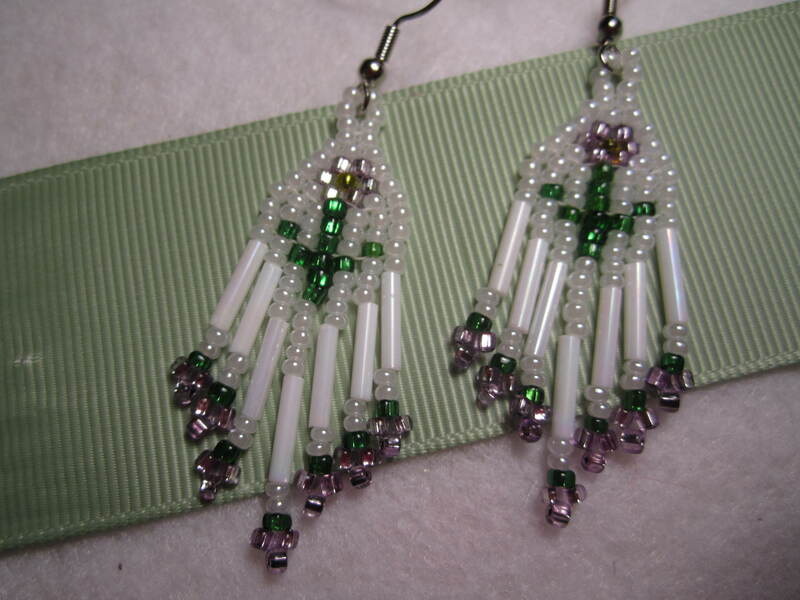 this next set I designed and made by myself only one earring is left after all these years !! I still love the brown and red and they still look great. I believe he made this chocker and I know I made the earrings !! The second and third pictures taken on a wooden surface are older and not as detailed I will try to retake them soon. 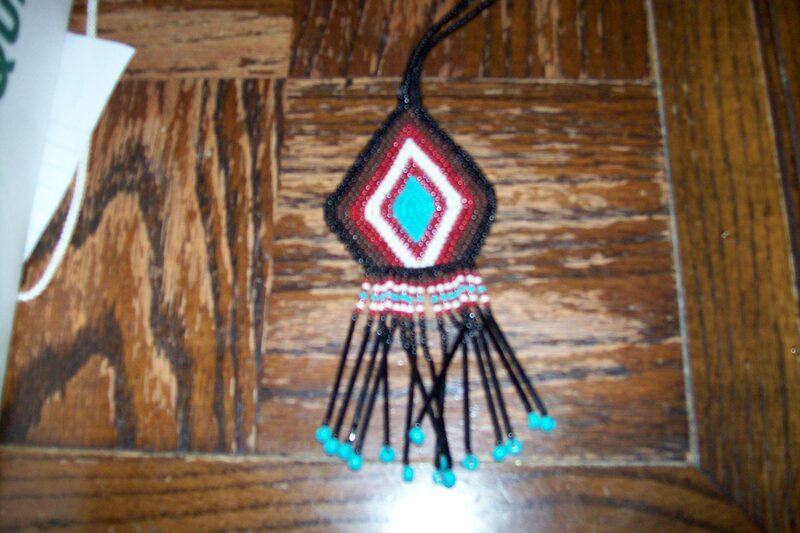 this is a hand beaded necklace, I did not use a loom, again, I will take better pictures of it later !! 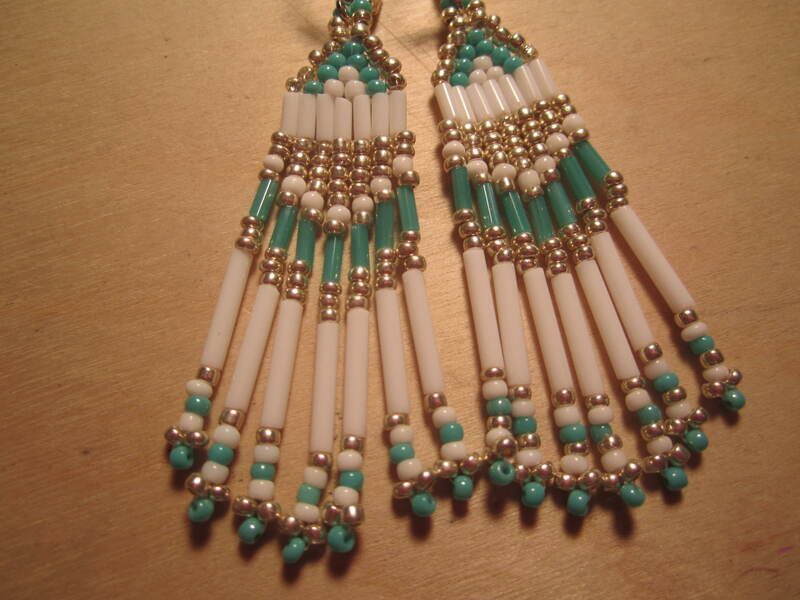 Oh, man, I love the ones that are turquoise and cream. 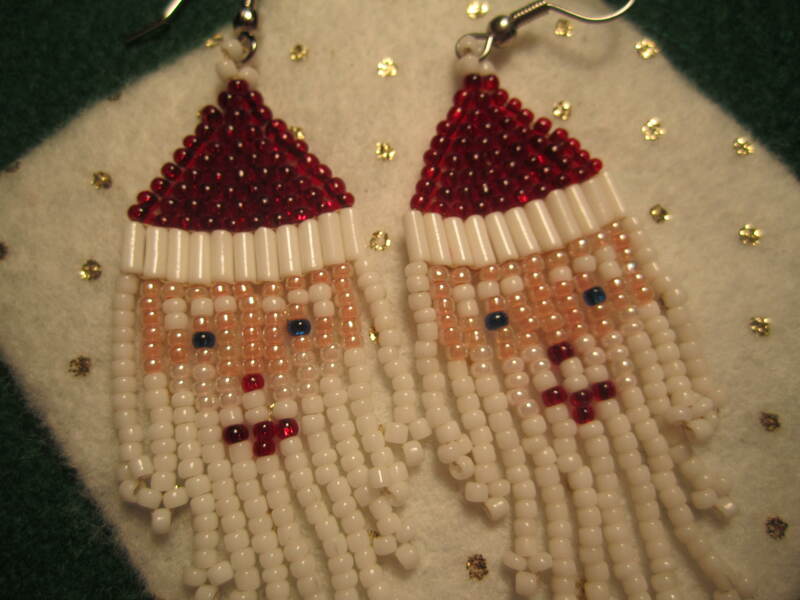 And what a hoot – I’ve made those Santa earrings, too. It is WONDERFUL to find this blog – which I only found because you found me. I’M SIGNING UP, GIRLFRIEND. 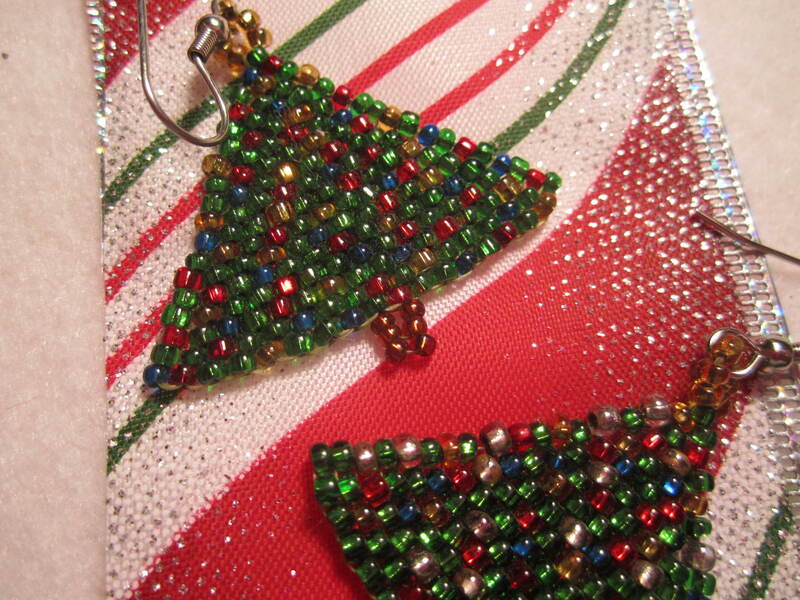 Bead on! And wait- you have a husband that beads??? I am so jealous! Dream of my life is to do my crafts with my husband, too. 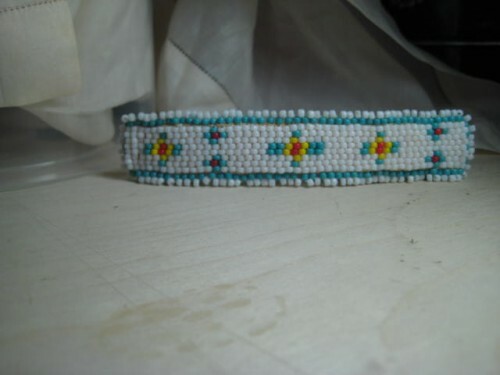 Funny thing is, he is the one that got me into beading. 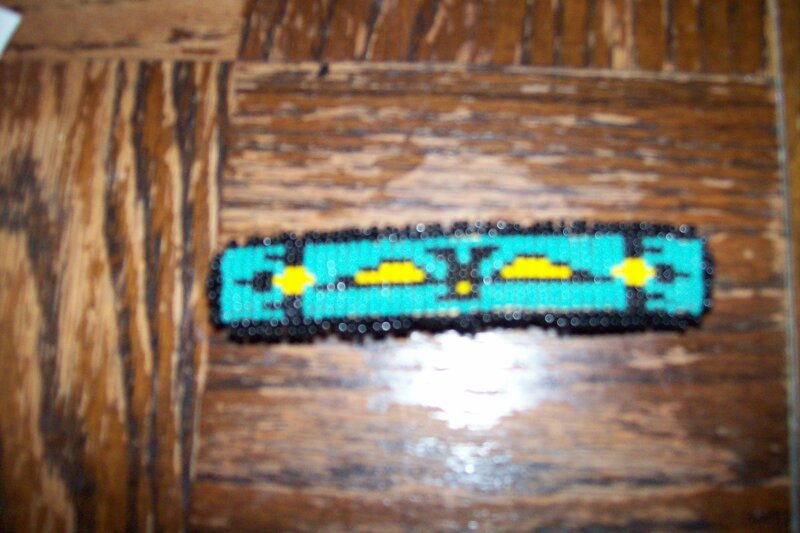 I was doing craft type beading , do you remember those tri bead pins ? 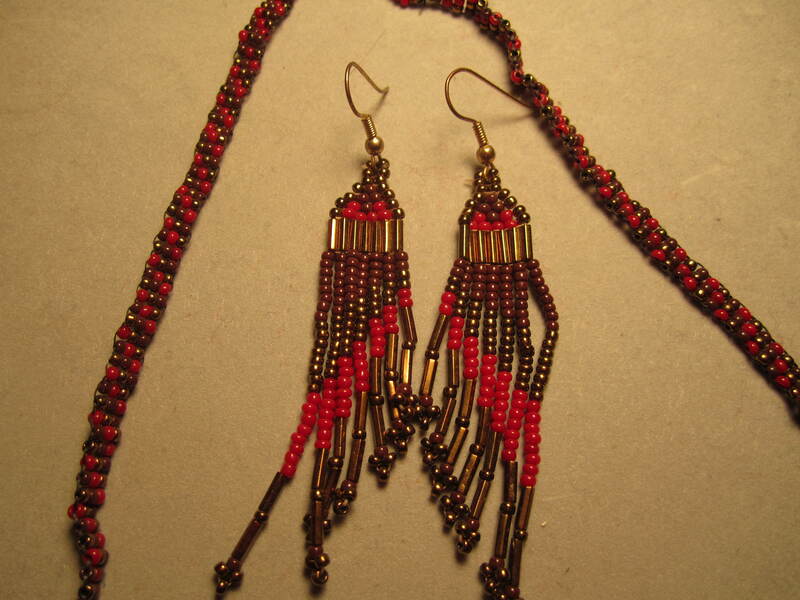 We went to Micheals to get me some more of my plastic tri beads and he saw a book on seed bead fringed earrings, and that was it, he taught me and now he has not done much in a while, but he was with me every time but the first time at the bead market and always helps me pick out new beads. I am trying to get him to do more with me too, I want him to teach me copper foil and stain glass, he has all those great scraps, lol !! 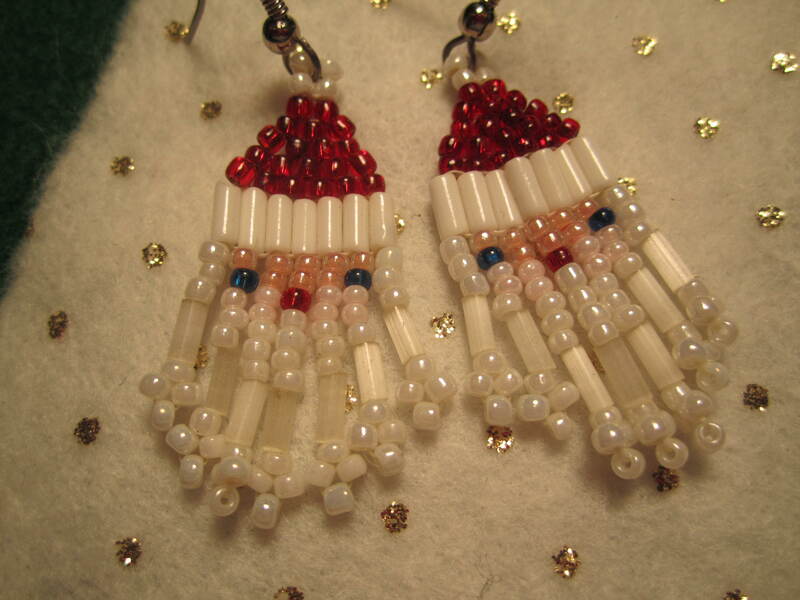 I know we c ould make some cool stuff together, so I am hoping, I would love to do some stuff with him, so I totally understand , it was when our kids were tiny, a million years ago he and I made earrings together. well, he would make the first one and then ask me to make the second, lol, he loved designing, but not making the match !! I am so glad I found you, it will be so fun seeing what each other comes up with !! So glad you came by here too !!! 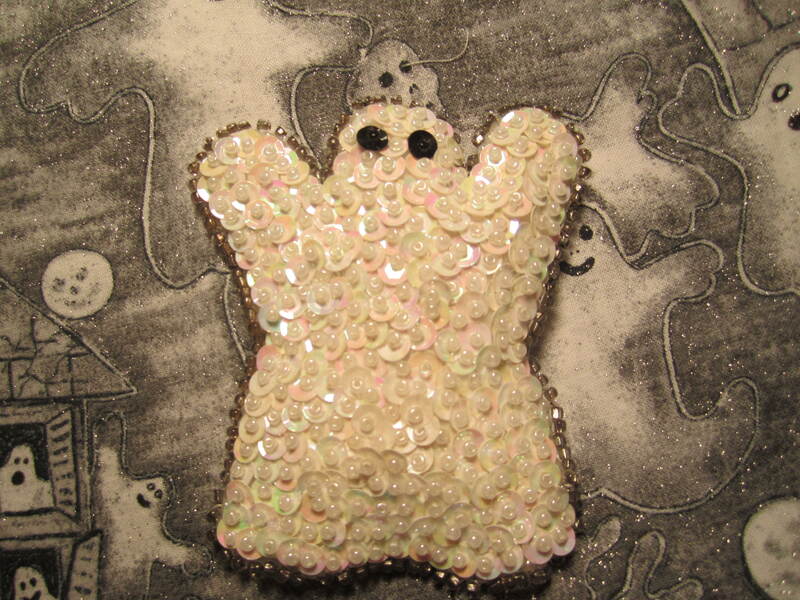 Wow, my middle aged eyeballs hurt just thinking about those tiny beads. Beautiful work! You made me laugh !! I am 55 but I will be honest, I do not enjoy threading those needles, I swear the holes are getting smaller as I get older !!! 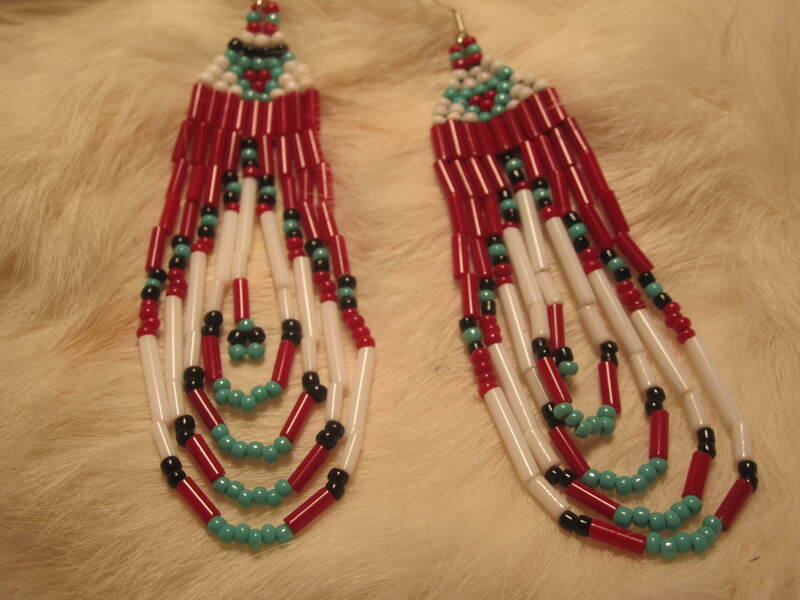 I love working with those tiny beads so much, and luckily I can see things up close, not far away and wear glasses for that , so seeing things up close is easy, if it were the opposite, I would be in big trouble !! 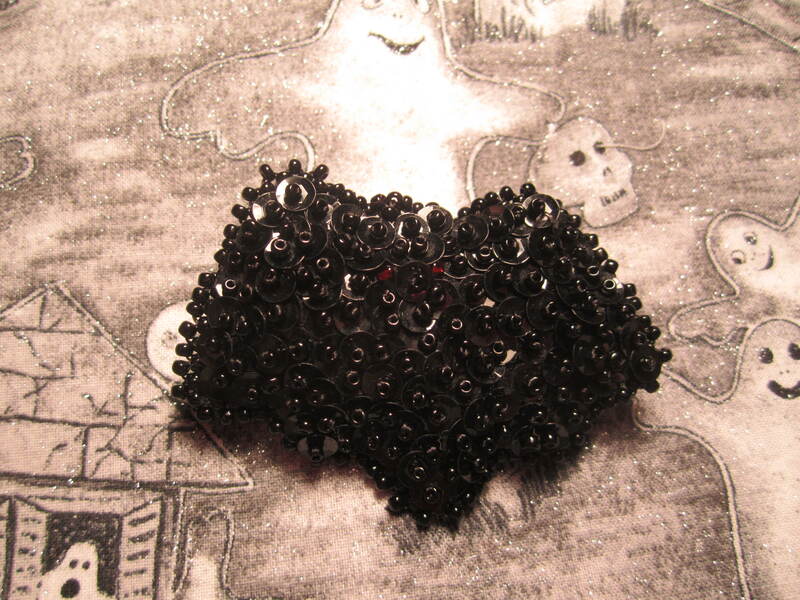 Thanks so much for the kind words, it means a lot to me, I love working with the seed beads so much !!! Thanks ! 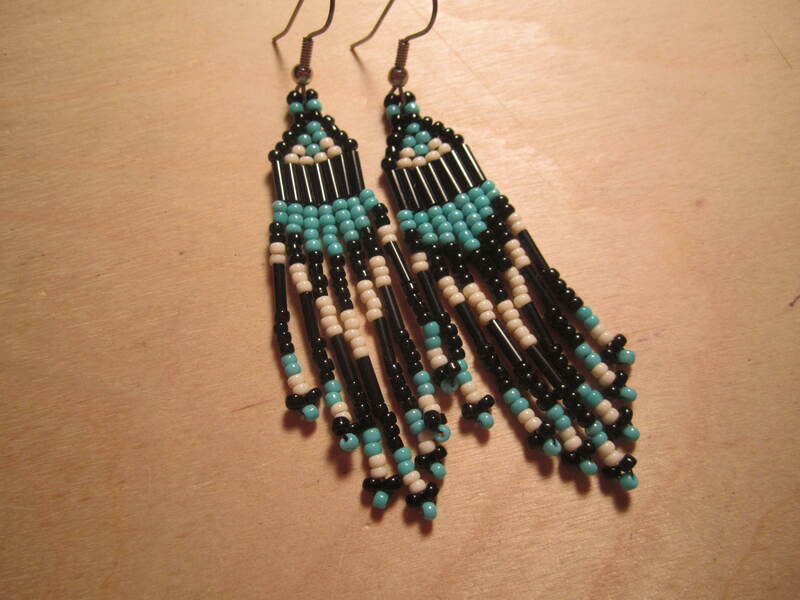 I call them Native American !! 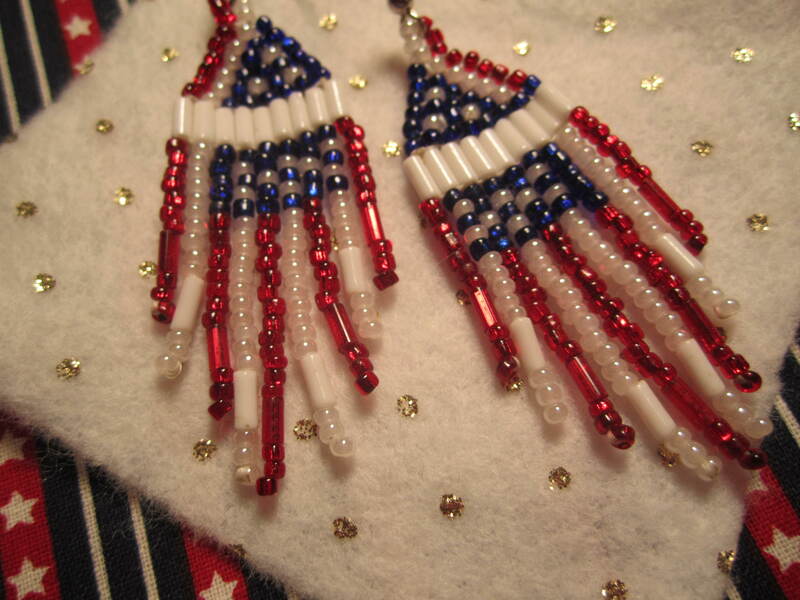 I have heard them called ethnic before !seed bead earrings is good too ! !